Here at AquAid, we’ve adapted the concept of the wishing well slightly by ensuring that through the provision of water coolers to our valued customers that this translates into building actual water wells for those less fortunate in Africa. How it works is that AquAid, who long have a history of supporting sustainable charities, formed a charity called The Africa Trust. This organisation is responsible for building said water wells or, as they are affectionately known, Elephant Pumps. Using donations from a portion of the revenue raised from the sales of water coolers, The Africa Trust have built more than 5 0000 Elephant Pumps throughout Africa, which provide more than 2 million people with safe drinking water. The pump is built (see photograph online in the article) using a modified design based on an ancient Chinese rope pulley system that uses materials that are easy to repair and maintain locally. An Elephant Pump can last for more than 15 years and its design is such that 95% of built pumps continue to operate throughout the continent. We recently invited York CVS, a Leeds based AquAid customer, to participate in a well building campaign and were delighted when they graciously accepted. York CVS themselves are all about help and support. Since 1939, York CVS has supported thousands of local charities, voluntary organisations and social enterprises to focus on what they do best – making a difference. They provide a range of support, training and advice to help organisations set up, flourish and even finish if they feel their work is done. 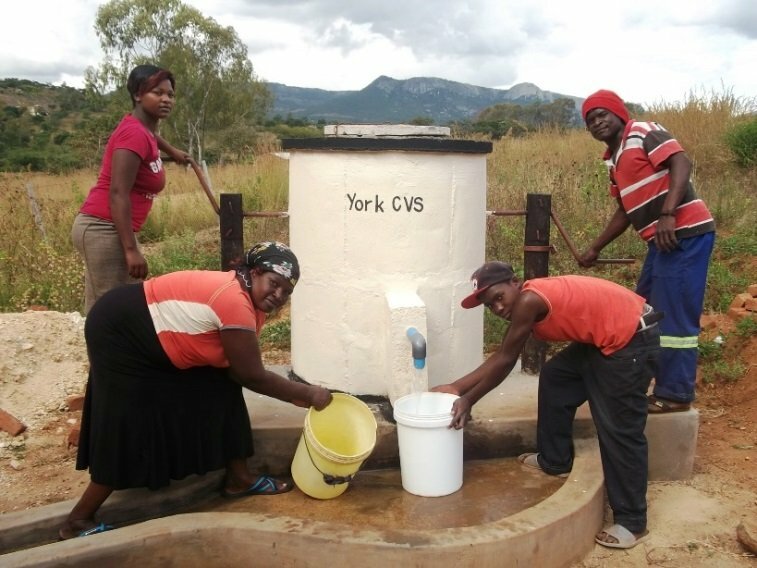 York CVS’ decision to participate in this water pump building campaign means that a rural community in Africa will now have access to safe, clean drinking water. If you currently have an AquAid water cooler and would like to find out how you can go about sponsoring your very own water well, at no extra cost, please contact us. If you would like to enquire about purchasing a water cooler, drop us a line or give us a shout at any of the above. We’d love to be able to assist. And you can, of course, be very well (ha) on your way to sponsoring your very own water well.